Funeral services honoring Evelyn’s life will be held on Saturday, December 8, 2018 at 10:00 a.m. at Piasecki Althaus Funeral Home, 3720 -39th Avenue, Kenosha, WI, 53144. Interment will follow in Sunset Ridge Memorial Park. A visitation for Evelyn will be held at the funeral home on Friday, December 7th from 4:00 p.m. until 6:00 p.m.
Evelyn V. Schaffer, 94, of Kenosha passed away on December 2, 2018 at Manor of Kenosha. 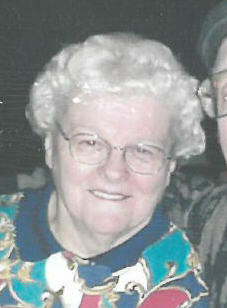 Born on December 23, 1923, she was the daughter the late Cecil and Lillian (Clauson) Hill. She attended local schools and graduated from Mary D. Bradford. On June 4, 1974 she was united in marriage to Robert V. Schaffer. Evelyn worked at American Motors on the assembly line and retired after 32 years of service. She later worked at the Factory Outlet Mall until it closed. A member of the Kenosha Women of the Moose Chapter #155, Evelyn enjoyed baking and cake decorating. She was artistic in painting china plates and cups. Evelyn is survived by her husband, Robert; her siblings, Joyce Westerman and Richard Hill; sisters-in-law, Judy, JoAnn and Susan Schaffer along with many loving nieces and nephews. In addition to her parents, she was preceded in death by her siblings, Marguerite Mahoney, Cecil Hill, George Hill, Wallace Hill and Lorraine Christensen and her mother and father-in-law, Viggo and Emma Schaffer.